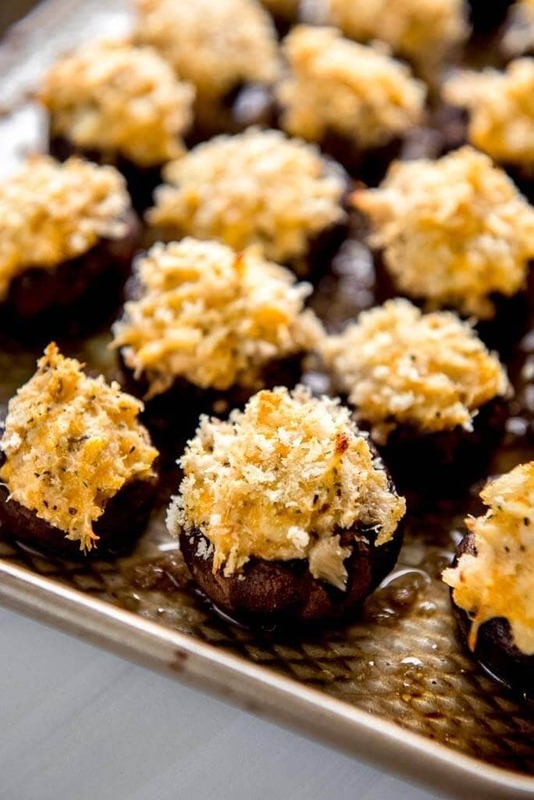 They may seem fancy, but these crab stuffed mushrooms are one of the quickest and easiest appetizers to make! No pre-cooking any ingredients and you can assemble them in minutes! With all of the holidays coming up there are sure to be plenty of get togethers, office parties and family gatherings. 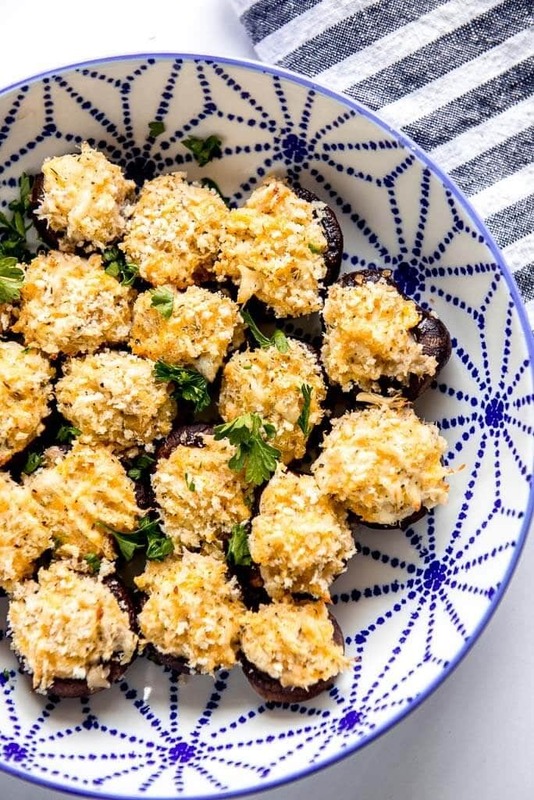 Why not impress your friends and family by making a delicious appetizer to share that will be the hit of the party? 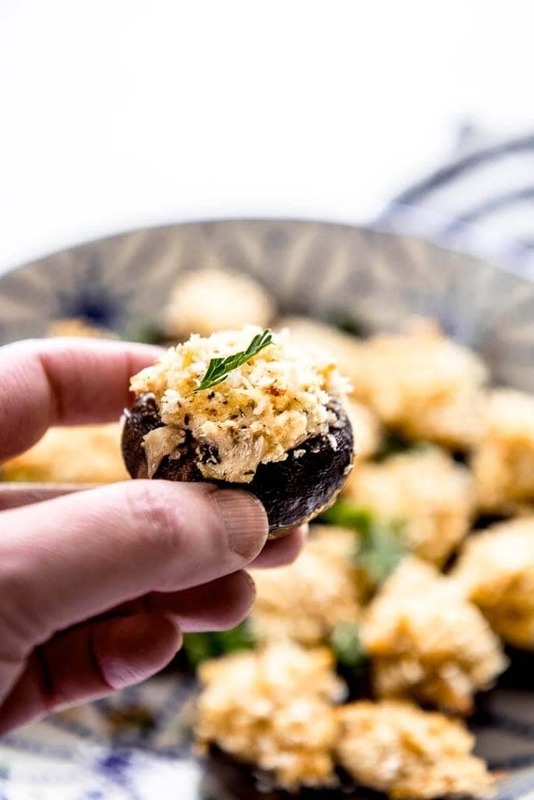 I love stuffed mushrooms but have never loved all of the work, so I came up with a way to stuff the mushrooms full of deliciousness without having to do a ton of work. These are easy to assemble in minutes and take only 20 minutes to cook. Perfect for an appetizer and even hearty enough for a light meal. You’ll want to start with some nice hearty mushrooms like portobellos. 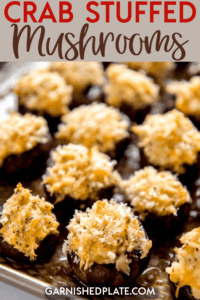 I used baby mushrooms because I wanted a bite sized appetizer that you could grab with your fingers and pop into your mouth. You could use larger mushrooms and adjust the cooking time. Many recipes call for shopping and cooking the stems and adding to the filling. Here we are going to skip it for two reasons. How do you make crab stuffing? 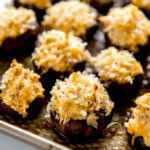 Like I mentioned above, this recipe focuses on stuffing as much cheese and crab into the mushrooms as possible. 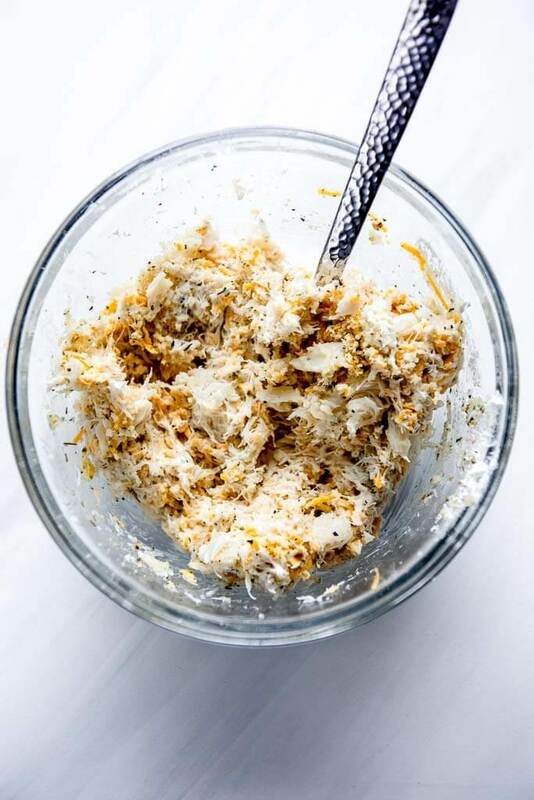 We use canned crab meat which saves a ton of time. 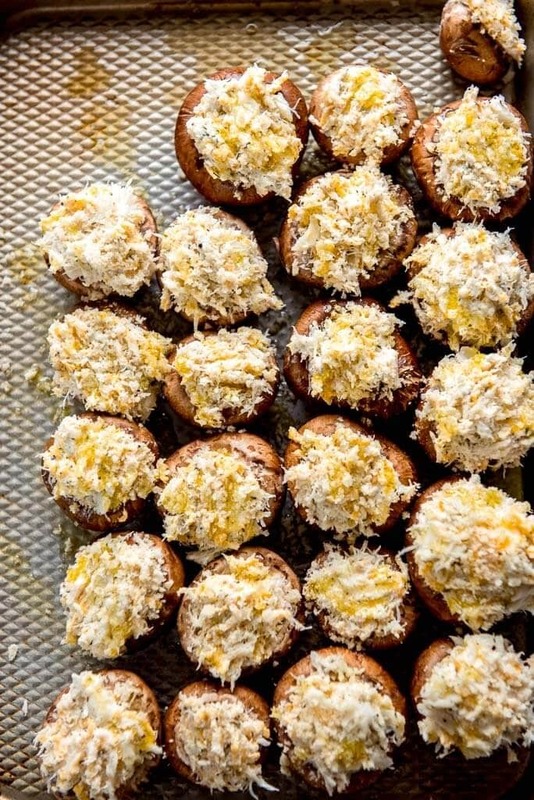 Make sure to grab lump crab meat so that you won’t have to pick through any shells. We will mix the meat from the can with whipped cream cheese, shredded cheddar, seasoning and bread crumbs for a quick filling. 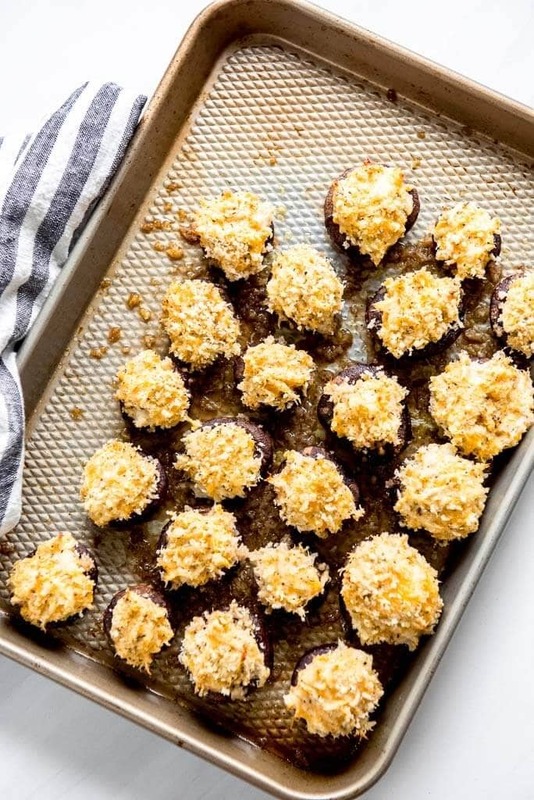 Sharp cheddar is my favorite for the contrast of flavor with the mild crab meat. Drizzle a little olive oil on the pan to help cook the “tops” of the mushrooms that will be on the bottom. Top the mushrooms with a little extra panko if desired and drizzle with a little more oil to get a crispy top. 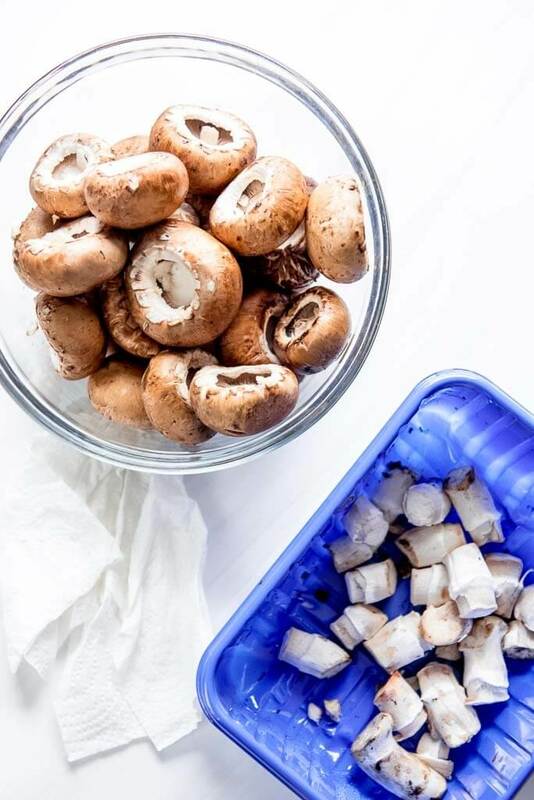 Bake at 350 degrees for 20-25 minutes until mushrooms are tender and then they are ready to serve!! I love to transfer them to a shallow bowl since they can slide off a plate a little too easily. That is, whatever doesn’t get grabbed up off the baking sheet before they ever make it to the serving dish!